Picture this: it’s late afternoon and you’re sitting on the sundeck of a well-appointed river boat sipping hibiscus tea and floating past the villages of rural Egypt’s Upper Nile Valley. Water buffalo take their rest in the shallows, and children play along the bank. Women work around their mud-brick homes, and men tend their fields with wooden ploughs. The scene is now, but it could as easily be a picture from centuries past. Little has changed for these people in a thousand years. And if you watch it all from a luxury river boat with a French balcony, or in some cases, your own sit-out balcony, you’ll get an even better view. You can almost imagine yourself a pharaoh, gliding along in luxury among his subjects. Between Aswan and Luxor – a distance of 180 kilometres which can be cruised round-trip or one way – you’ll take in Esna, Edfu, and Komombo, but the highlight, most agree, is Abu Simbel in the country’s far south. The two temples in Abu Simbel are spectacular enough, and instantly recognizable – the largest and most iconic built for Ramses II to honour himself and the state gods, and the Temple of Hathor to the north built for his first wife Nefertari. But even more incredible is the modern-day feat of moving them, block by block, and reconstructing them to exact specifications 61 metres above their original site. Why? To avoid the floodwaters of Lake Nasser, created when the Aswan High Dam was built. 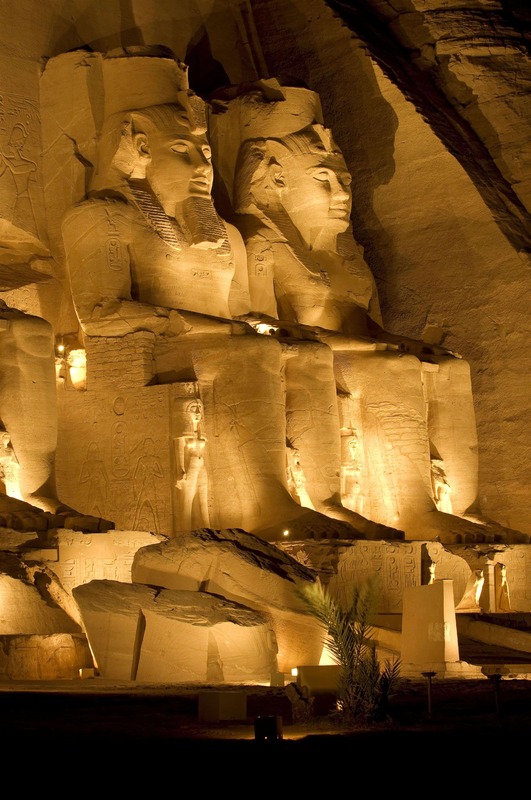 Abu Simbel is one of several ancient sites moved to higher ground, but certainly the most important. It’s not included on all Nile cruise itineraries in Upper Egypt (i.e. the south) just those with the three-day Lake Nasser journey where you cross the Tropic of Cancer. In some cases a sail is included on a classic felucca to Kitchener Island in this area. Most cruise lines offer a felucca trip at some point in the voyage. In Aswan, you can visit the Botanical Gardens, the High Dam, and the Temple of Isis among other attractions. The Unfinished Obelisk, the Nubian Museum, and the Philae Temple are also well worth seeing. Or you might find yourself joining a short camel caravan to visit a Nubian Village for tea with the residents. Farther north, as you approach Luxor, you’ll stop at Komombo to visit the twin temples of Sobek, the crocodile god (anything from the life-giving Nile was considered sacred) and Hareoris the sun god. Another stop is at Edfu to see the Temple of Horus, said to be the best-preserved temple in Egypt. In Luxor (see page 8) try and see Deir El Medinah. It’s the first known “workers’ village” where the workforce who built those massive temples and tombs for the mighty pharaohs actually lived. This section of the Nile, between Luxor and Abu Simbel, has about a third of the entire world’s antiquities and the highlights described above are a mere handful of what’s in store for cruisers. Most river boats include lectures by an Egyptologist, who also accompanies the excursions. 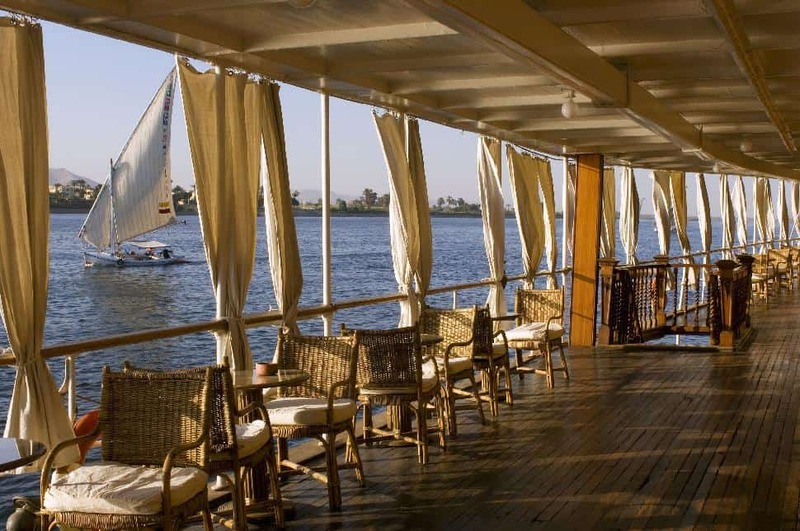 For the adventurous, a very different style of Nile cruise is aboard a traditional felucca, as far from the “floating hotel” style of vacation as you can get. Most people enjoy such a cruise for a few hours, but multi-day trips can be arranged on the larger vessels between Aswan and Luxor. Accommodations are primitive, and travellers sleep in the open on deck. The sailors double as cooks. And if you take a sense of humour and a sense of adventure, it’s fun. Another kind of waterborne adventure is to join a dive cruise in the Red Sea. These range from budget trips to luxurious, purpose built teak motor yachts like the MY Sea Serpent operated by Nubian Nile Cruises. The ambience is like sailing on a very rich friend’s luxury boat. The luxury stretches to include fully air-conditioned cabins with TV and en-suite bathrooms, and a bar on the sundeck. The boat accommodates a maximum of 20 passengers in 10 cabins, and all meals are included. Whichever mode of travel you choose to traverse the Nile, there are few better ways to experience Egyptian history and culture.